Americans are dying in different ways than they used to. 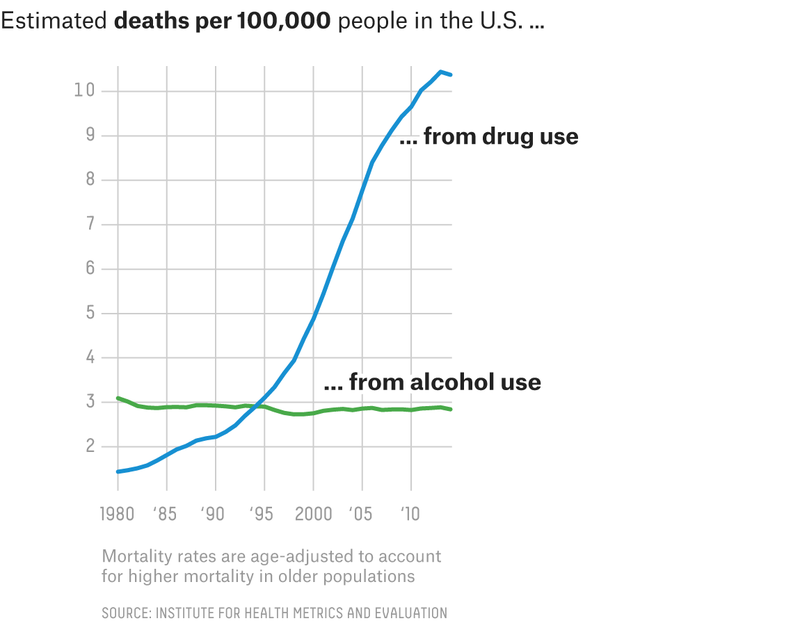 As of 2014, more were dying from drug use than in years past, even as deaths from alcohol had largely remained unchanged. Deaths resulting from interpersonal violence were on the decline, but fluctuations (and a recent increase) in deaths from suicide meant that violence was still a relatively common cause of death. 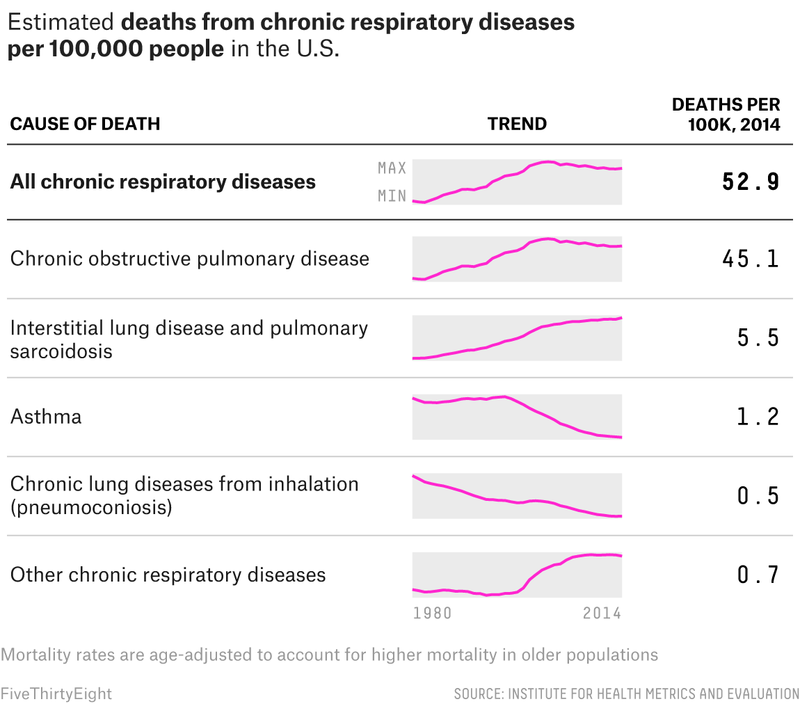 Over the previous decade, deaths from chronic obstructive pulmonary disease — the main types are chronic bronchitis and emphysema1 — had steadied, even beginning to slowly decline, but it remained a leading cause of death. Even as the trends differ, however, they have something in common: huge disparities by region and sometimes even within states. Some of the biggest increases in diarrhea-related deaths have taken place in the Northeast and Midwest, for example — likely as a result of infections that stem from antibiotic use. 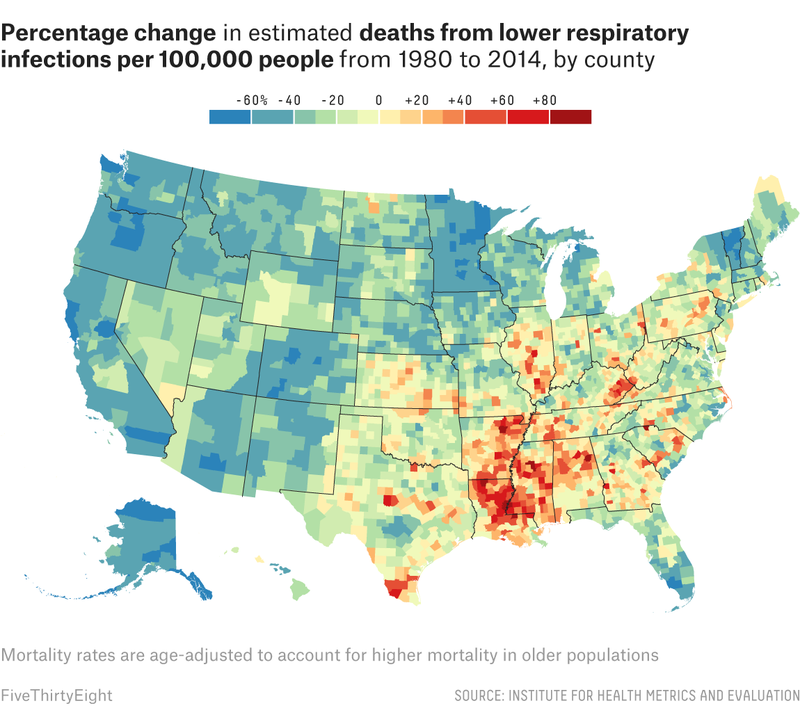 All of this can be seen in 35 years of county-level mortality estimates, covering 1980 to 2014, that have been released by academic researchers who attempted to fill in the gaps on mortality statistics, painting one of the clearest pictures yet of how people die in the U.S.
Mokdad is part of a team at the institute, which is based at the University of Washington, that has published an analysis of 21 mortality categories, including more than 80 causes of death, within the U.S.2 — an analysis that we’re also publishing in our interactive map of the ways Americans die. The most recent update to it — which adds several new death categories — provides a deeper look at some of those ways and how they’ve changed over time. Of the major infectious diseases, diarrheal diseases were the only cause of mortality that increased nationally from 2000 to 2014. Much of that can be attributed to deaths from C. difficile, a bacterium that can cause life-threatening intestinal issues, which are most commonly found among older patients whose immune systems have been weakened by antibiotic usage — making many of these deaths the result of medical treatment. 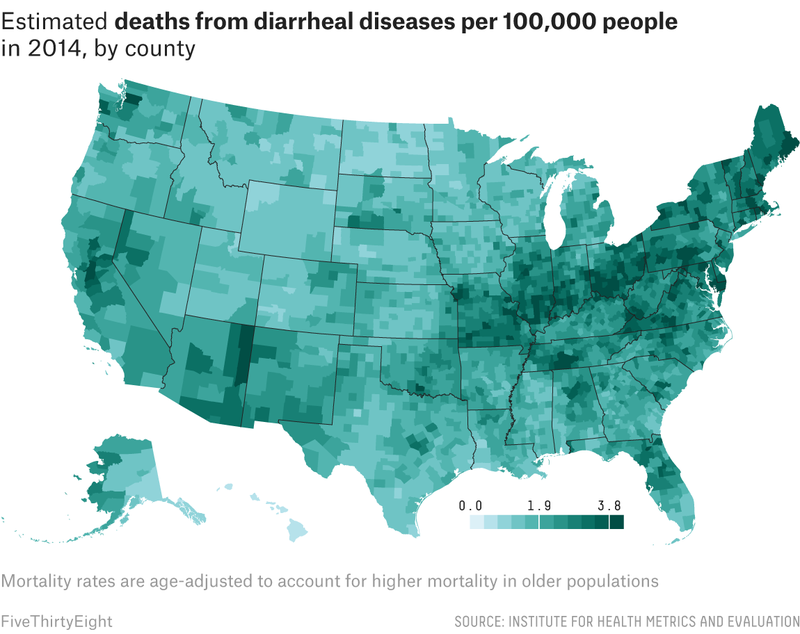 A corridor running from Missouri to Maine, with its heart in the Rust Belt, saw some of the highest rates of mortality from diarrheal diseases in 2014. The rise in opioid deaths has been called an epidemic in recent years, and the data from the institute backs that up. It found an increase in the drug use mortality rate in just about4 every county in the U.S. from 1980 to 2014. 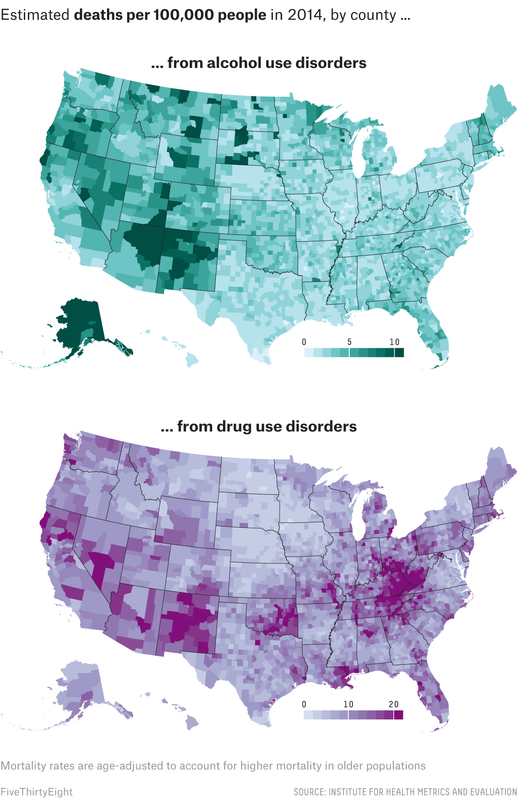 Alcohol and drug use deaths also vary geographically. Notably, the Southern Black Belt, which has high rates of mortality for most causes of death has some of the lowest rates of death from substance use. 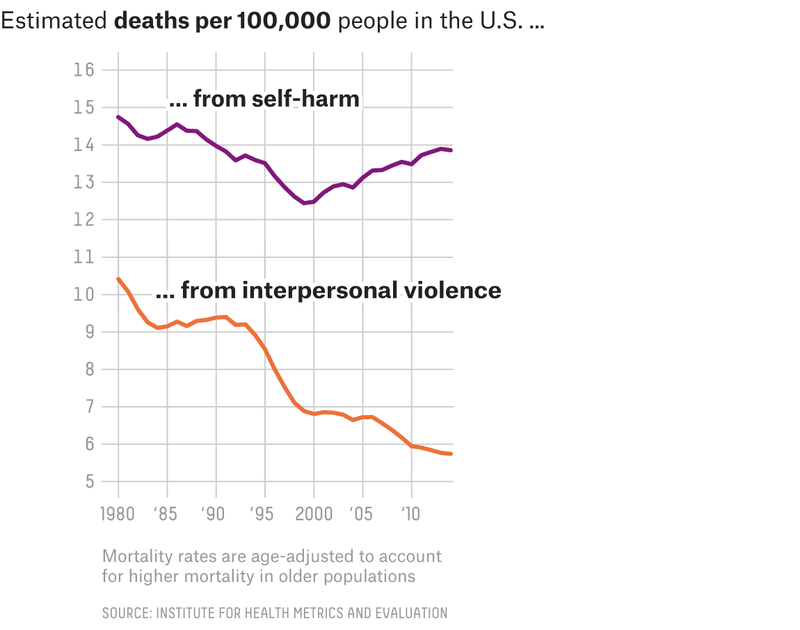 An overall decline in violence-related deaths took off in the 1990s because of a precipitous decline in deaths from interpersonal violence, a category that includes5 assault, domestic violence and child abuse. However, a recent uptick in suicide has kept the combined category among the leading causes of death. Some of the decrease in mortality from interpersonal violence is the result of improvements in medicine that have increased survival rates after an incident. Many of these deaths result from firearms, which are once again under increased scrutiny after 17 people were killed in a school shooting in Parkland, Florida. Mass casualty events understandably capture a lot of the headlines around gun violence in the U.S. But as FiveThirtyEight has explored previously,6 the majority of gun deaths are from suicide — categorized as “self-harm” in the institute’s data — a problem that has grown since the late 1990s. There are clear regional patterns for violent deaths, with suicides happening at a high rate in the Mountain West, and interpersonal violence death rates high in the rural Southeast, on some Native American reservations and in a handful of large cities. The rate of death from chronic respiratory diseases was dramatically higher in 2014 than it was in 1980. And more than 4.6 million people died from those diseases over that 35-year period. The vast majority of those deaths are from chronic obstructive pulmonary disease, which is most commonly caused by cigarette smoke. That’s just some of what we found while exploring the new data. But don’t let our eyes be the only ones that look for interesting trends: Explore the maps yourself. Generally, COPD is caused by long-term exposure to irritants that make breathing difficult. Data on how many Americans die from what has always been incomplete because of what are known as “garbage codes” — vague or missing causes of death — on death certificates. The researchers at the institute have used statistical modeling to estimate more accurate causes of death for each county, taking into account the incomplete data. 75.1 percent saw a decrease; for 56.9 percent of all counties, the decline was statistically significant. Every county saw an increase in drug-related mortality — for 99.8 percent of counties, the increase was statistically significant. The category does not include deaths related to war or terrorism or police-involved deaths. Not all violent deaths are caused by guns, but a majority are, largely because guns are so lethal.